This instrument is the most elaborately ornamented scroll model mandolin made by Orville Gibson that we have ever encountered. The hand-written label reads "Made by O.H. Gibson 1906 Kalamazoo Mich." The 1906 date, which also appears on a peghead inlay and on the tailpiece, is of interest since this date is well after the incorporation of the Gibson Company in October 1902. By mid 1903, Orville Gibson had sold his stock in the Gibson Company and had little if any ongoing relationship with the Gibson Company after that time. The year 1906 is the latest date we have encountered on any instrument produced by Orville Gibson. While Gibson Company instruments bear printed labels with the Gibson Mandolin-Guitar Co. logo, this particular instrument has an entirely hand-written label and has no indication that it was produced by the Gibson company. It would appear that Orville Gibson wanted to make it extremely clear that this was his own personal work rather than a company product. A pearl inlay at the tip end of the peghead is engraved "O.H. Gibson 1906," the label is handwritten and makes no mention of the company, and the tailpiece cover is engraved "O.H. Gibson" rather than "The Gibson." The base plate of the tailpiece is engraved with the date 1906. The construction of this instrument is very much like those produced by Orville during the late 1890s. The neck joint is Orville-style, with the heel of the neck flush with the side rims. The volute on the back of the peghead and the friction tuners, rather than geared pegs, are typical Orville Gibson features. The carving of the back, with steeply angled arching at the edges and the flat central expanse, is typical of Orville's work. The back, sides and neck are of walnut, as are most Orville-made instruments. The body dimensions and shape are typical of Orville's work. Essentially, this instrument is a throwback to the structural techniques Orville used prior to the incorporation of the Gibson company. Although the earliest Gibson Company instruments feature construction essentially the same as Orville's handmade instruments, within a very short time the company began abandoning Orville's original concepts in favor of construction that was more compatible with factory assembly line techniques. While there are no existing documents to confirm reasons for the changes, it is my opinion that Orville's technique of combining the neck and side rim of the body as a unitary construction would have been very awkward in production. The very deep relief carving of the scroll would unquestionably be more difficult in production than the later Gibson design, and the carving pattern of the back would likewise be a problem for mass production. The friction pegs that Orville utilized on F-style mandolins would almost certainly not appeal to most players as much as geared tuners. Orville's body size is significantly larger than later Gibson mandolins and the shallow neck-set angle and the low bridge, in the opinion of most players, simply do not work as well as the later design with a higher bridge and steeper neck set angle. What few records remain from the period hint that Orville did not support company management's decision to alter his original design concepts to accommodate customer demands or to facilitate easier factory production. 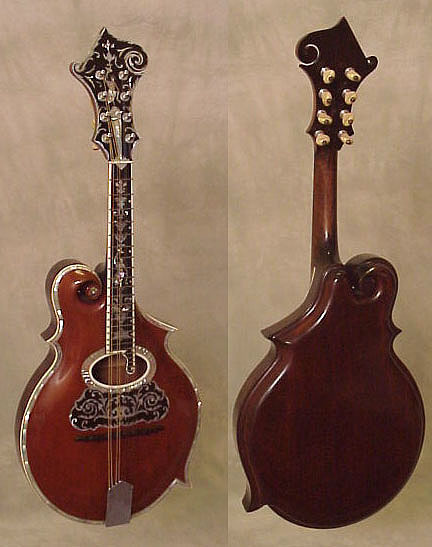 It is pure speculation as to why Orville Gibson produced this particular mandolin in 1906. I have not encountered any other examples of instruments handmade by Orville Gibson built later than 1902. It is my personal speculation that this instrument was very likely made by Orville in an attempt to demonstrate to the Gibson company that his original design concepts were indeed superior to the direction they had taken and perhaps to influence them to see the "error of their ways." For whatever reason he produced this instrument, it is clear that Orville intended it to be a presentation instrument designed to show off the best of his talents. This is the most elaborately ornamented scroll model Orville Gibson mandolin I have ever encountered. The instrument is in fine structural condition and is currently set up in good playing order. It has a sound that is notably different from the later Gibson mandolins but is very much like that of the very few other genuine Orville Gibson made mandolins I have encountered that are still in playable condition. The tone might best be described as semi-classical. This mandolin was on display at the Gibson factory in Kalamazoo until 1961, at which time the Gibson president Ted McCarty made a ceremonial presentation of the instrument to Maurice Berlin, the CEO of Chicago Musical Instrument Co. (which had purchased Gibson in 1944). After the death of Maurice Berlin, the instrument was passed on to his son Arnie, from whom we acquired it. This mandolin has very little playing wear. It would appear that it served primarily as a display piece. Unlike other famous luthiers, who produced relatively large numbers of instruments over a considerable span of years, Orville Gibson had a very short career. The earliest instrument attributed to Orville is a 10-string mandolin-guitar bearing a small circular plate engraved with the date 1894. Although it can not be proven that this is Orville's earliest, no earlier examples have been found and the 1894 date has been accepted by the Gibson company as the start of Orville's career as a builder. Only a very few examples of Orville's personal handwork remain. His instruments feature carved tops and backs, which was a radical departure from previous guitar and mandolin building techniques. While Orville stressed that his instruments featured violin building principles of construction, his carving patterns and his technique of incorporating the neck and the sides in a unitary construction are radically different from those of any violins. It is clear that Orville was an innovative builder with an artistic flair. He produced at least two lyre shaped mandolins as well as scroll models (known as F-style) and simple symmetrical pear-shaped (A-style) models. He made guitars in a variety of body sizes, but most of them were notably large for instruments of the 1890s. While the Gibson Company abandoned many of Orville's structural concepts early in the history of the company, it is very clear that Orville's designs laid the foundation for the company's products. The concept of the carved mandolin and guitar appear to originate with Orville Gibson rather than to have been an evolutionary concept built upon designs of previous guitar or mandolin builders. Although Orville's total personal output of instruments was very low, it would appear that he was one of the most innovative luthiers in history. For a maker who produced only a few instruments over a span of as little as 12 years, his influence on the industry is entirely out of proportion to his personal output. Modern jazz guitars and carved model mandolins are still produced today with designs that can be clearly traced straight back to Orville's work. I know of no performers currently using an instrument handmade by Orville Gibson. Since playable examples of Orville's work are extremely scarce, it is entirely possible that had he not been successful in selling his design concept to a group of Kalamazoo businessmen who incorporated the Gibson company, his instruments might be virtually forgotten today. Any surviving example of Orville Gibson's work is an extremely important historical artifact. While this mandolin did not influence the owners of the Gibson company to revert back to Orville's early design concepts, as the finest presentation grade handmade Orville Gibson mandolin ever made and very possibly the last instrument produced by Orville Gibson in his career, this is without doubt an extremely significant, historically important instrument.